This quilt is the first in an ongoing series of “impossible” multi-dimensional shapes inspired by the work of Oscar Reutersvard, M.C. Escher and other artists. In 1934, Oscar Reutersvard, a Scandinavian artist considered the father of impossible figures, designed a single triangle composed of only nine cubes. In order to intertwine these triangles, I increased the number of cubes, and then, after countless drafts, combined two triangles, intersecting and framing the resulting star with a spoked hexagon of my own design. 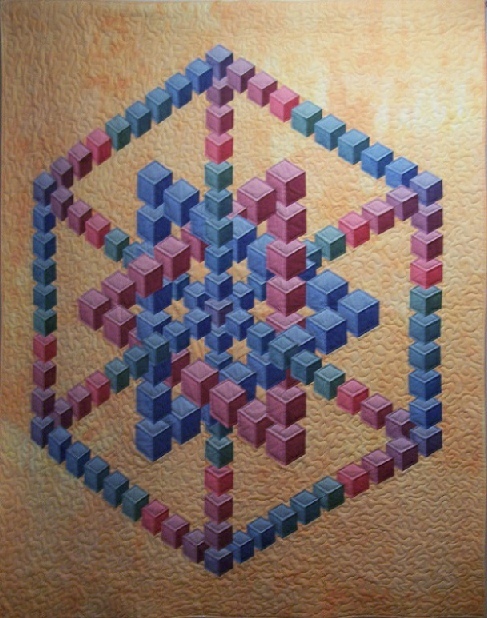 The quilt was constructed using templates, and then machine-quilted with metallic thread.